Did you know that people enter babies into beauty queen pageants? 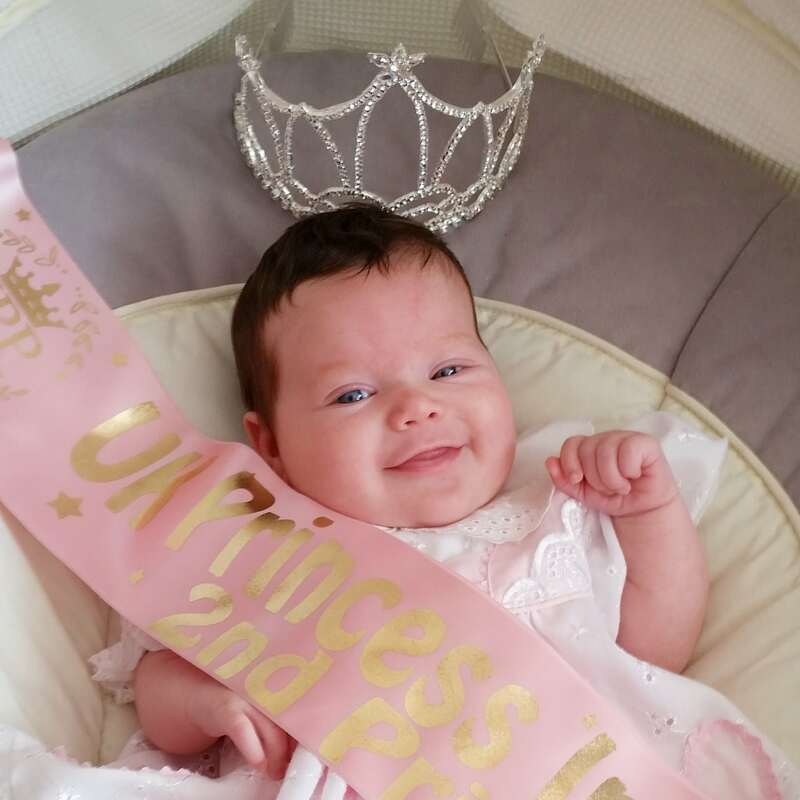 One of our clients shared her story of how her baby became a beauty queen baby at just six weeks old! I flicked on the television and carefully lowered myself onto the sofa. It was a hot July, I was eight-months pregnant and my bump seemed to be expanding at an extraordinary rate. I skimmed through the channels and noticed, ‘Toddlers and Tiaras’ was on. “Perfect,” I thought to myself. The children on the show were always so beautiful and confident. They had learned new skills, like dancing and singing, and I wanted my own baby to grow up with the confidence I never had when I was a little girl. I rubbed by round belly. “That will be you soon, Luna. And we’ll be walking down the catwalk together.” I knew, even before my baby was born, when I saw her image on the screen at my antenatal session, I knew deep down, like all mothers do that my baby was going to be beautiful. So, I entered by un-born baby into her first contest: The UK’s Prince and Princess International Beauty Pageant’s 0-2 year-old category. 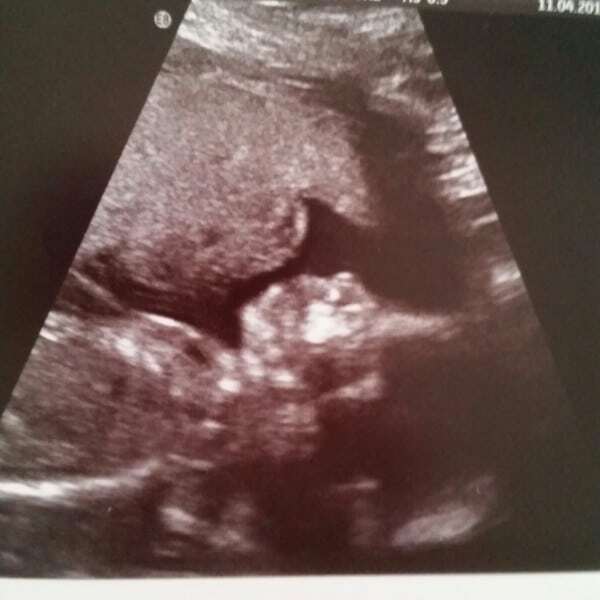 I sent in a picture of my 20-week scan of Luna and to my astonishment, she was accepted. I was over the moon and couldn’t wait to walk my little girl down the run way in the September pageant. Even though her scan picture looked nothing like a baby, and more like an alien, I knew she’d be a natural beauty. Come August and my beautiful baby was born at Cross House Hospital weighing a healthy 9.6lbs. Five-weeks before the pageant, when Luna was nearly six weeks old so my mum, Luna and I went shopping for essentials. “I need three different outfits: an outfit of choice, a beauty dress, and a, ‘what I want to be when I’m older,’ outfit,” I said to my mum, Yvonne, 55. “What about this?” my mum suggested, holding up a little pair of horse riding boots and some really cute brown trousers. “A horse rider? Perfect,” I thought. I bent down to adjust Luna’s booties in her pram. “You wouldn’t mind being a horse rider when you’re older would you?” I said, kissing her on the forehead. I also bought a red mermaid costume with a matching head band and a beautiful white flowing dress. It was finally the day of Luna’s first competition and my stomach tightened in nervous knots. The event started and Luna had three wardrobe changes, but slept through the last one. To my delight, she came 2nd in the Princess competition and despite the rapturous applause, she didn’t even stir. Mum and I were over the moon. Luna was awarded her own sash and a big silver crown, and when she finally woke up, she lapped up all the attention she was getting. And in true diva fashion, she yawned, let out a drool, and dozed right back off to sleep again, leaving the local press hanging. 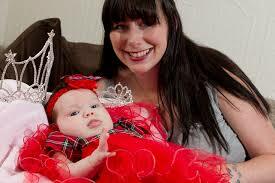 Pageants can be stigmatised and most people seem to think we’re bad parents for entering our children into them. The truth is it’s enriching for our children, and a doctor has already told me that Luna is above average for interaction for her age. But a lot of the young girls wear make-up, fake tan, fake nails and spend a lot of money on outfits and styling their hair, which I’m dead against. But at the end of the day it’s up to each individual how much they want to do it. After all the fun we had at the first pageant, I entered Luna into ‘UK Dreams Glasgow,’ 0-2 year-old category, for her second pageant. She won first princess in the 0-23 month’s category and 3rd princess in the 2-4 years categories. She left the competition with yet another crown and two more sashes. It was safe to say I was a proud mummy. Her silver crowns already have pride of place in my living room and all of her sashes are hung around the house. Luna even managed to raise £200 for a children charity. I don’t think I’ll stop entering Luna into pageants anytime soon, but when she comes of age, she may decide to stop doing them altogether, which is fine by me as it’ll be her decision, but for now I think it would be nice to keep adding to her collection. SWNS is the largest press agency in the UK. Not only do we provide the national press with world exclusives, we also like heartwarming, charming, funny, lighthearted and daft stories. If you would like to sell a story to the press, simply fill out the form on the right hand side of this page and tell us a little bit about your story. One of our operatives will review your story idea and will get back to you within 48 hours with an offer. We cannot be beaten on price, and nothing you send us will be printed without your permission. If you would like to sell a story, photo or video to a National Press Agency and achieve the highest fee possible, you’re in the right place. SellusYourStory.com is the direct way to sell your story to the press. Whether you want to sell a story, photo or video to Newspapers, Magazines, or Television companies (or all three), SWNS is unrivaled in the media. 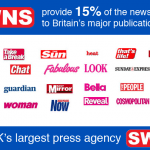 SWNS is the UK’s largest independent press agency. 11 Offices including: Bristol, Birmingham, London, South East, Leeds, Plymouth, Cambridge, Aberdeen, Glasgow and Edinburgh. 60% of news comes from agencies, 20% of agency news is from SWNS. 500+ graduate placements now working in all parts of the media. Embedded in our offices are reporters for The Sun and The Daily Telegraph. Busy news room with news reporters, photographers/videographers and feature writers. Features desk writing content for consumer titles (chiefly women’s magazines). Newswire subscribed to by all national media and key regional publications. Daily contact with the national media. Picture desk and library (over ½ million images).